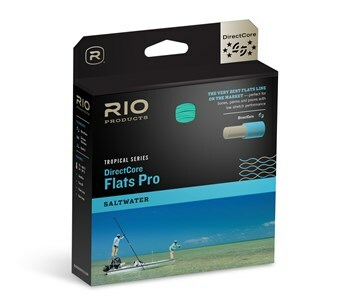 RIO has announced a new line to their DirectCore Flats Pro line series. The StealthTip offers the same taper and technology as the series, but with a six-foot clear intermediate tip. IDAHO FALLS, IDAHO (December 1, 2017) – Prepare for your next saltwater trip with RIO’s new DirectCore Flats Pro StealthTip fly line. As part of RIO’s award-winning DirectCore Flats Pro line family, the StealthTip offers anglers the same taper and technology but with a six-foot clear intermediate tip. The DirectCore Flats Pro StealthTip fly line is ideal for bones, permit, and tarpon with a distinctive taper design that allows perfect close-range presentation, as well as fast, accurate distance casts. DirectCore technology uses a proprietary low-memory, low-stretch monofilament core that retains stiffness in heat yet lies incredibly straight on the water allowing for a direct connection to the fly as well as up to 20 percent more strength than equivalent saltwater fly lines. The taper has a mid-length head and extended back taper for stable, accurate casts with a finely-tuned weight distribution for making delicate presentations. The StealthTip version of this line features a full-floating head with six feet of clear intermediate at the tip, which allows for shorter leaders and easier, more accurate casts, while the increased density provides great wind penetration. In addition to the new core technology, the Flats Pro StealthTip is built with RIO’s unique triple-colored, range-targeting line color system SureFire to easily gauge accuracy and distance on a cast. Find this line at your nearest RIO dealer for a retail price of $119.99 in clear/aqua/orange/sand color configuration in WF8F/I through WF12F/I with a sink rate of 1.5ips. For more information, please watch the video on the Flats Pro line family here. RIO is a pioneer in developing fly lines, leaders and tippet material to enhance fly fishing experiences across the globe. Offering premium fly lines for both freshwater and saltwater fishing applications, RIO consistently utilizes field experience and scientific testing to create the best products on the market for anglers. Founded 20 years ago in the mountains of Idaho, RIO continues to develop innovative products, design revolutionary tapers and refine performance-driven fly line technologies. For more information about RIO Products, please visitwww.rioproducts.com. Connect with us through Facebook, Instagram, and Vimeo.